To prepare for a US launch, our client sought to understand the job market landscape along with the current behavior, unmet needs and pain points of job seekers, especially when using employer reviews. Secondary research identified which US markets would provide a representative overview of the US employment landscape along with a competitive assessment of current offerings. Digital ethnographies and in-depth interviews provided a deep dive into job seeker’s individual processes and related needs and emotions. Discovery groups across job seeking audience segments were conducted to ideate on desired features and functions for employee reviews. 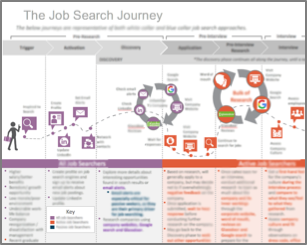 Job seeker journey maps were created to highlight processes, pain points and resources for each job seeking segment. Persona profiles established a more robust identification of potential user audiences and their associated needs. 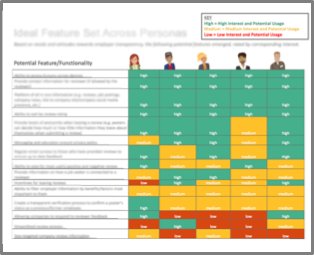 Heat map of persona specific features and functionality by priority informed product development and helped to differentiate the product from the current competitive offerings.